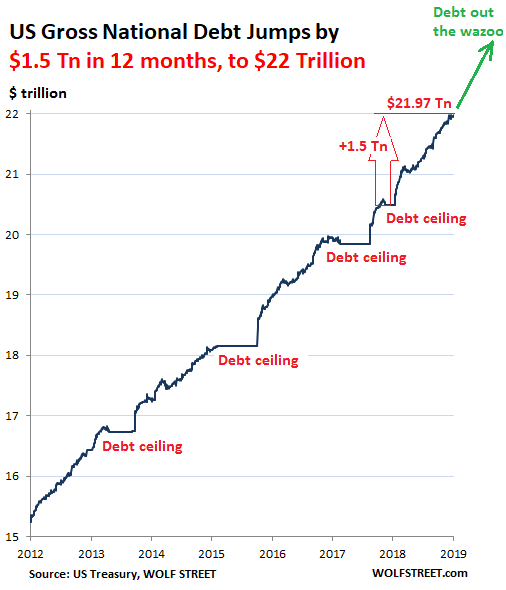 WHO BOUGHT THE GIGANTIC $1.5T OF NEW US TREASURY DEBT OVER THE PAST 12 MONTHS? 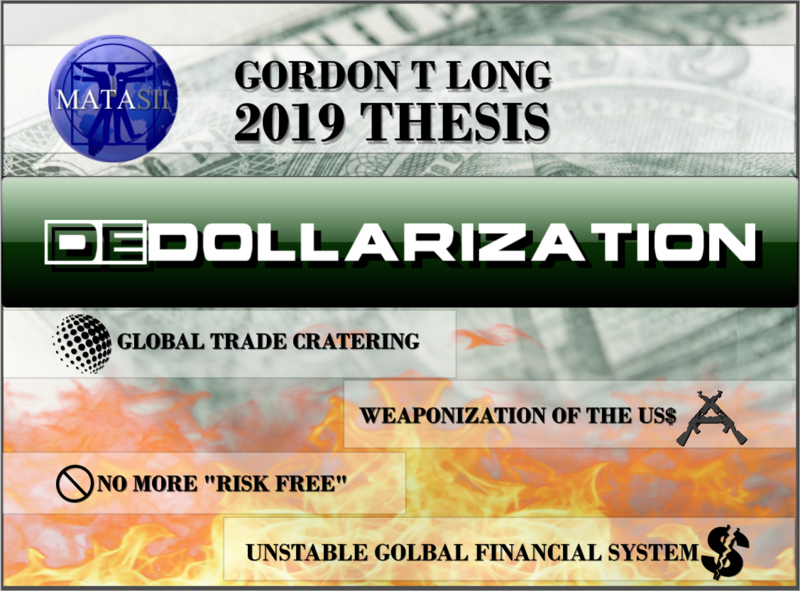 SOURCE: 01-31-19 - Wolf Richter - "Who Bought the Gigantic $1.5 Trillion of New US Government Debt Issued over the Past 12 Months?" American Banks are incentivized to hold US Treasuries for Capital Requirements Reasons & Excess Reserve payouts by the Fed. The $20B of Net Buys above from Government entities (ie Social Security) is a complete distortion. Soon existing Government Bonds ($5.9T - green pie area above) will be forced to be sold for payouts to retiring Boomers (which is presently a $84T unfunded liability). The $5.9T of Treasuries is only ~25% of this requirement. The $78T will require additional debt to be financed. The Unfunded Pension Tsunami will completely, and VERY SOON consume the US Treasury's ability to fund US governmental needs. So, who bought all this debt? 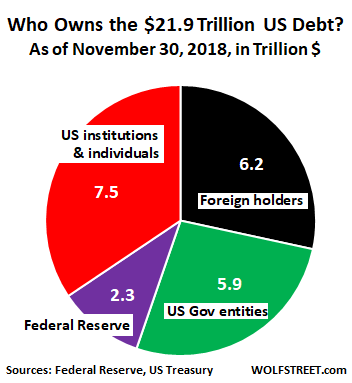 US government debt, as expensive as it is in terms of interest payments for US taxpayers, is a mildly income-producing asset for the creditors of the US. Somebody has to buy it, every last dollar of it. The US relies on it. So, who bought this pile of debt that got issued in 12 months? China, Japan, other foreign investors? Nope. They’re gradually unloading this debt. 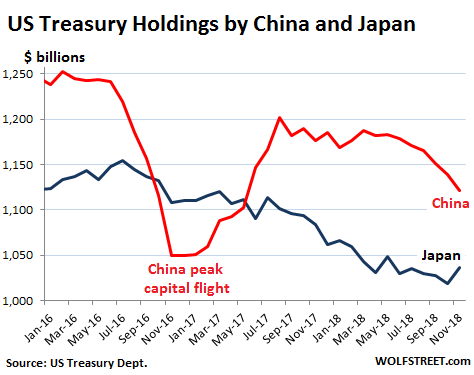 The Treasury Department divides these foreign investors into two categories: “Foreign official” holders (foreign central banks and government entities) cut their holdings by $144 billion over the 12 months, to $3.9 trillion at the end of November. But private-sector investors (foreign hedge funds, banks, individuals, etc.) increased their holdings by $52 billion, to $2.3 trillion. Though China and Japan remain the largest foreign creditors to the US, their relative importance has declined. 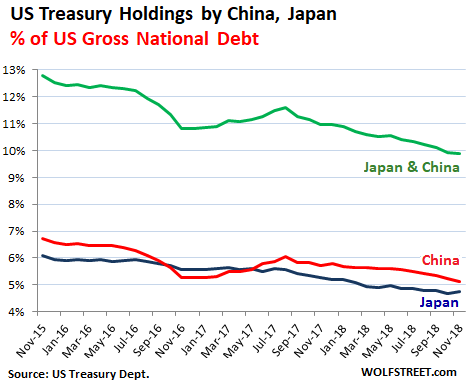 Over the 12 months through November 30, as China and Japan reduced their holdings by $103 billion combined, the US gross national debt soared by $1.26 trillion, to $21.8 trillion. So, China holds just 5.1% of US gross national debt (red line in the chart below), and Japan holds 4.7% (blue line). Their combined holdings (green line) has now dropped below 10% of the US gross national debt. To round off the top 10 largest holders of US Treasuries, here are the remaining eight. 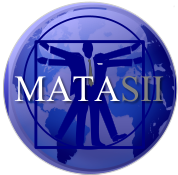 Most of them are tax havens for foreign corporate and/or individual entities. Belgium is the location of Euroclear that holds about $32 trillion in assets in fiduciary accounts. The value in parenthesis denotes the holdings in November 2017. Cayman Islands: $208 billion ($240 billion). With Foreign Creditors Net Sellers, Who’s Buying? When that appetite among American banks and other big institutions for US Treasury debt wanes, yields will rise because buyers will have to be lured into this market to absorb this flood of new securities on a weekly basis. But so far, so good – with the enormous appetite among American entities pushing down the 10-year Treasury yield today to 2.63%. TBAC SUDDENLY WORRIED ABOUT SLIDING DOLLAR RESERVE STATUS & WHO WILL BUY $12T IN FUTURE US DEFICITS? WHO IS THE “OTHER” DOMESTIC BUYER OF TREASURIES THAT HAS BOUGHT $2T SINCE ‘TAPER’ ENDED?